As of last year, more people are using their smart devices to browse the Web instead of computers. Due to the change in information medium, it's important for businesses to create a responsive website that meets the needs of its consumers through a page that can be displayed fully and comfortably no matter what screen size is accessing it. By making your website responsive, you make your business's information more convenient and therefore more accessible to anyone searching for it. Responsive means that a website naturally adjusts to fit all of the content into a readable column no matter what the screen size is. 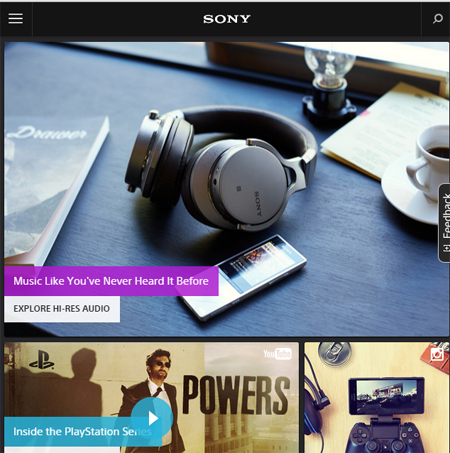 For example, Sony.com has a responsive Web page. If you view the page on a laptop and minimize the window to the size of the palm of your hand all of the same information and images that were displayed at full screen are still shown, despite the smaller window size. The same principle is true for tablets and smartphones. No matter what the screen size or orientation are, the website will adjust automatically, which makes viewing the page much easier for the user and cuts out any extra steps they may have to take to get their content. Depending on whether or not your business already has a website, it's advantageous to explore all of your options when thinking about how to make your responsive design. If you don't want to outsource your Web design, take advantage of some responsive website hosting sites like Wordpress.org and Webflow.com. These sites, and many others like them, provide templates that are automatically responsive without the need of inserting any extra code. However, if your business already has a static Web page, you will need CSS3 media queries in order to make the site responsive. This rule can be applied to a number of common screen sizes, including smartphones (about 480 pixels), as well as tablets (600 px x 768 px) that accommodate viewing your website fully without losing content. The fluid grid is important to your responsive design because unlike your CSS3 code, specifically designed to fit all of your information on the designated screen size, grids keep everything in proportion on the page. No matter what device is being used to access your page, fluid grids assure that the website will appear the way it was meant to be, with all of the elements purposefully displayed. Fluid grids are more adaptive than traditional liquid layouts, which just expand the page and center the information on the display. Although this type of layout can work, it can also distort the page and make it blurry or low-definition depending on the device it's being displayed on. Considering smart devices are poised to constantly increase pixel count, it's wise to just go with a fluid grid to make your website most visually appealing. This total is applied to the target element in your fluid design. You have many options when creating your new responsive website, but always strive to make your site more user friendly. Any website can be artistically crafted, but could be impossible to navigate. During your responsive makeover, there are options to hide your sidebars or headers for certain screen limitations. Prioritize and consider what information is most important to your website and put that at the forefront without sacrificing style or tab options. Always be aware that people are looking at your page from a variety of different devices, so make your links and tabs easily accessed through both mouse and finger clicks. In the past, businesses would create an entirely separate mobile-friendly website in addition to their normal, default computer-viewed website. Those earlier sites were often stripped down, abbreviated versions of their parent sites, and the result was inferior in both content and design. Take the unrestricted road and make your responsive website accessible and convenient for anyone. The availability of information across many different devices is staggering and will only continue to expand. With the circulation of smaller devices with more features, businesses must adapt to stay relevant and keep in contact with the people who need their services. The examples given are just the beginning for making your business's website responsive as more mobile options increase every year. Drew Hendricks is an experienced marketing professional and social media strategist with more than five years of experience in creating successful campaigns for clients.